Waking up to the fresh ocean air, the Carolina sun rising over the blue Atlantic Ocean, you sip your Starbucks coffee and begin to think about your day. If you are wanting to try some good southern food and not sure where to begin, we have just the list for you. Shrimp and Grits — As the name implies, this traditional Lowcountry favorite combines a pair of main ingredients that are readily available in the region: fresh local shrimp and hot corn grits. (And while the dish is seen with regularity on lunch and dinner menus these days, it was originally a breakfast dish often referred to in the Lowcountry as “breakfast shrimp.”) On the Grand Strand, one of the best versions of this signature dish can be found about 6 miles north of Bay View Resort at Hook & Barrel, where the shrimp is served over Adluh stone-ground grits with a spicy added twist — andouille sausage. Explore the full menu at hookandbarrelrestaurant.com. 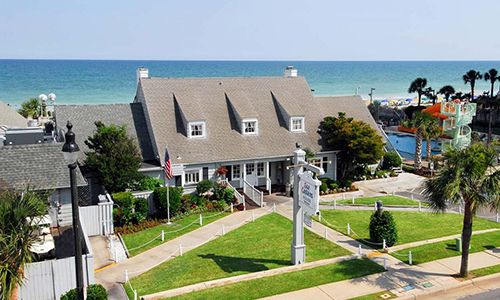 She Crab Soup — Guests at Bay View Resort will head a couple of miles north to taste one of the Grand Strand’s best versions of this rich and creamy soup featuring Atlantic blue crab meat — the Sea Captain’s House, located right next door to the resort, serves some of the area’s most acclaimed. See what else the treasured local seafood restaurant, a favorite among foodies in the Myrtle Beach area for over 50 years, has cooking at seacaptains.com. Oysters — The Sea Captain’s House is also home to some of the area’s best oyster offerings, available broiled or fried as an entrée, or fresh, raw and on the half shell as an appetizer with a lemon wedge and cocktail sauce. Key Lime Pie — While this decadent dessert flavored with the tart, aromatic juice of the Key lime may have originated farther south in the Florida Keys, it’s an established after-dinner dynamo on the Grand Strand. One of the best versions — made with real Key lime juice and baked in a flaky chocolate crust — can be found at Sweetgrass Bakery and Cafe, located just over 5 miles north of Bay View Resort on North Kings Highway. Check out the bakery’s full menu of fresh-made goodies at bakerybysweetgrass.com. Bloody Mary — We’ll conclude our list with this popular Grand Strand cocktail featuring vodka and tomato juice, and often accented with other spices and flavorings such as hot sauce, Worcestershire sauce, garlic, herbs, horseradish, celery, and olives. Visitors can grab one of the area’s best at the Flying Fish Public Market & Grill, located at North Myrtle Beach shopping/dining/entertainment hot spot Barefoot Landing. Explore the restaurant’s full menu at flyingfishmarket.com. After a fun day discovering new flavors, head back to The Bay View Resort to rest and relax and plan your next day.